Mometamax for dogs is a prescription only medication, and it is prescribed to treat bacterial and fungal infections in the ear. This medicine may also be prescribed to reduce the amount of inflammation present, so that any pain and swelling are relieved. Mometamax otic suspension contains a trio of drugs which are intended to treat a wide range of infections and conditions, so it is a common treatment for dogs that have irritation or an infection in the ear. Mometamax for dogs is considered a broad spectrum treatment, and it is very effective against a number of organisms that can cause an infection in your dog’s ear. Ear infections in dogs are not difficult to treat, but some medications only address a limited range of bacterial or fungal causes, and will not work well for others. Your vet may prescribe Mometamax for dogs to ensure that the responsible organisms are effectively treated. The medication is only needed once each day, so giving the treatment to your pet is convenient. This medication combines the antibiotic gentomyacin sulfate with the anti fungal clotrimazole and the anti inflammatory mometasone, and is very effective in treating almost all cases of ear infection in canines. A dog ear infection home remedy may provide temporary relief of the symptoms, but this type of treatment will not eliminate the underlying cause of the infection. Mometamax for dogs will resolve the infection whether it is caused by bacteria or fungi, and the anti inflammatory component helps eliminate inflammation that can cause pain and irritation. There are other prescription medications that may be prescribed if the exact cause of the infection is known, but Mometemax can be effective against many organisms so testing may not be required. Baytril for dogs is another antibiotic that can be effective if certain bacteria types are responsible for the infection, but this drug usually requires testing to identify the cause before being prescribed. 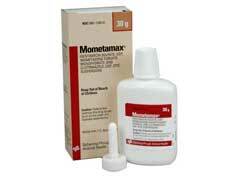 This step is not usually required before Mometamax is prescribed.